» May the odds be ever in your favor! I am such a big fan of the Hunger Games trilogy, I'ver read the books over and over and I still can't get enough. I sat in line, online, and waited so I could get my boyfriend and I some of the absolute best seats for the Mockingjay: Part 1 premiere tomorrow in Copenhagens largest movie theatre hall. I am so excited and while I did some Effie Trinket inspired make-up for last years premiere, I am not sure there will be time for that at NWMA tomorrow. However, I will probably do the Katniss braid! 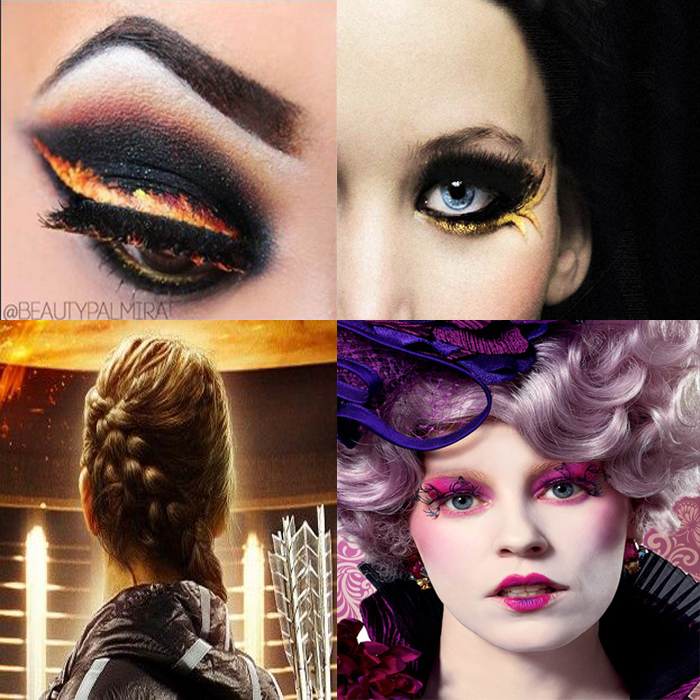 I found some really cool pictures on pinterest, some of the characters Effie Trinket and Katniss Everdeen's make-up, one of Katniss' braid and some Mockingjay leader inspired make-up as well. I even found a quick step-by-step on how to make the perfect Katniss braid, if any of you would be interested in doing one of those for the premiere or just for the look - let's be honest, it's a pretty cool look. Click here for the tutorial. Are any of you going to see Mockingjay Part 1, and are you as big fans as I am?